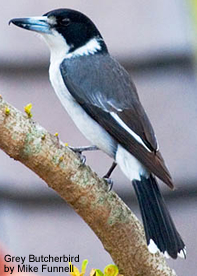 Butcherbirds are magpie-like songbirds that are native to Australasia. They were named for the way they store their prey -- hanging captured animals on a thorn, tree fork or crevice to support them while they are being eaten, or to store them for later consumption. Butcherbirds are mid-sized birds, measuring up to 35cm in length. The color of their plumage ranges from black-and-white to mostly black, with possibly grey plumage, depending on the species. The bill is large, straight with a distinctive hook. The average clutch consists of one or two eggs in a clutch. The chicks are often seen trailing behind the mother and "squeak" incessantly begging to be fed. Butcherbirds mostly feed on insects, but will also take small lizards and other prey. They will also accept scraps, such as mealworms or bread.